Detonating cord (also called detonation cord, detacord, det. cord, detcord, primer cord or sun cord) is a thin, flexible plastic tube usually filled with pentaerythritol tetranitrate (PETN, pentrite). With the PETN exploding at a rate of approximately 6400 m/s, any common length of detonation cord appears to explode instantaneously. It is a high-speed fuse which explodes, rather than burns, and is suitable for detonating high explosives. The velocity of detonation is sufficient to use it for synchronizing multiple charges to detonate almost simultaneously even if the charges are placed at different distances from the point of initiation. It is used to reliably and inexpensively chain together multiple explosive charges. Typical uses include mining, drilling, demolitions, and warfare. "Cordtex" and "Primacord" are two of many trademarks which have slipped into use as a generic term for this material. Detonating cord is rated in explosive mass per unit length. This is expressed in grains per foot in the United States, or in grams per metre elsewhere. A "grams per metre" rating will be roughly one fifth the "grains per foot" rating. For example, "50 grain det. cord" refers to detonating cord which has 50 grains of explosive per foot of length—or approximately 10 g/m. This is a typical "default" rating for connecting charges for blasting; lighter detonating cords may be used for "low noise blasting" and movie special effects, while heavier cords, used where the cord is employed to have some direct explosive effect—such as for precision rock carving work—may use 50 to 250 grain/foot (10 to 50 g/m) detonating cord. Low-yield detonating cord can be used as a precision cutting charge to remove cables, pipes, wiring, fiber optics, and other utility bundles by placing one or more complete wraps around the target. Detonation cord is used in commercial boilers to break up clinkers (solidified coal ash slag) adhering to tube structures. Also a vertical centered cord being lowered into the water of a drilled well can remove any clogging that obstructs water flow. Higher-yield detonating cord can be used to cut down small trees, although the process is very uneconomical compared to using bulk explosive, or even a chainsaw. High-yield detonating cord placed by divers has been used to remove old dock pilings and other underwater obstructions. Creating a slipknot from detonating cord yields a field-improvised device that can be quickly employed to cut a locked doorknob off a door. 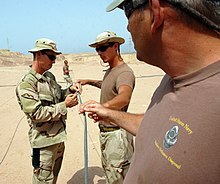 Detonation cord can be taped in several rings to the outline of a military man-sized target and detonated, breaching a man-sized hole into wooden doors or light interior walls. Detonating cord is also employed directly in building demolition where thin concrete slabs need be broken via channels drilled parallel to the surface, an advantage over dynamite since a lower minimum of explosive force may be used and smaller diameter holes are sufficient to contain the explosive. Anything much more substantial than these uses requires the use of additional explosives. The Finnish army colloquialism for detonation cord is anopin pyykkinaru (mother-in-law's clothesline), as it resembles ordinary clothesline. In Filipino, the corresponding word mitsa has come to be used in a phrase “mitsa ng buhay” which translates to "detonating cord of [one’s] life", a metaphor for something that is very likely to cause one’s death via direct jeopardization (e.g. extreme sports, versus smoking). Detonation cord was referenced in the 2009 film A Perfect Getaway by Timothy Olyphant's character as "a handy tool". A length of detonation cord was used to clear a path through a minefield in the 2009 film Terminator Salvation. Detonation cord was shown to be used by US cavalry troops to clear trees from a landing zone in the 2002 movie We Were Soldiers. A spool of primer cord was used by Alan Alda's character Hawkeye in the TV series M.A.S.H. (Season 9, Episode 12, "Depressing News") to demolish his newly built replica of the Washington Monument crafted from tongue depressors. Fiona Glenanne from the TV show Burn Notice uses detonating cord very often to breach enemy buildings. Wikimedia Commons has media related to Detonating cord. "Primacord Technical Information" (PDF). Dyno Nobel. This page was last edited on 31 July 2018, at 22:50 (UTC).